Training a dog is no walk in the park. It is a serious and important process which every pup should go through. 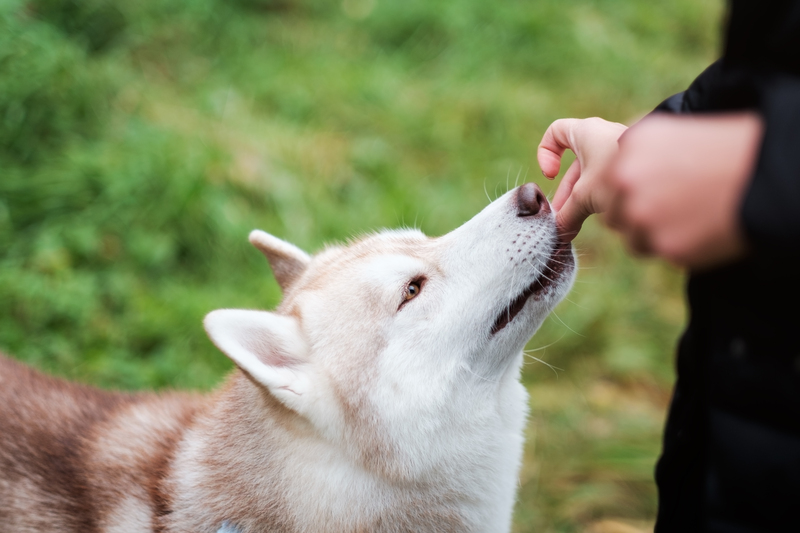 In order for the training to be successful, the dog needs to be motivated and nothing tops a tasty treat when they perform well. Enter the dog pouch, the best way to carry treats with you and conceal them from your four-legged pal at the same time. Dog pouches come in many shapes and forms and price points. Here are some of the best dog training treat pouches. KEEPS YOU PREPARED: You'll love the convenient built in dog poop bag holder so your dog waste bags are ready right when you need them. Quickly grab your favorite dog training clicker from one of the 2 convenient d-rings while obedience training with your pup. 3 EASY WAYS TO WEAR: Choose to wear using the removable 48" adjustable waistband, removable shoulder strap, or strong metal belt clip. Made of lightweight weatherproof nylon fabric that keeps your dog treats dry while on those fun early morning walks with your doggy. STORE YOUR STUFF: Safely store your smartphone, money or keys in the two zippered pouches or front mesh netting while taking a stroll with your doggie. This ultimate dog treat bag has it all! 100% MONEY BACK GUARANTEE + GREAT GIFT IDEA: Love your new dog treat pouch or your money back! We guarantee your complete satisfaction. Also great for puppy training classes. CLICK ADD TO CART NOW! The Paw Lifestyle is a moderately priced training pouch that’s great for everyday activities with your dog. It comes with a spacious treat compartment, sturdy and lightweight construction, and modern design. All the bare necessities, such as waste bag dispenser and accessories pockets, are also included. The Paw Lifestyle pouch has a large treats compartment. The inside is padded with neon green nylon lining for better visibility when you need to reward your pooch quickly. The compartment is waterproof and features a handy drawstring with which you can close it securely. Also, for easier washing, the lining can come out. On the outside, the pouch is gray and the design is neat and discrete. There are two accessories pockets, one in the front and the other in the back. Both are secured with zippers for holding your phone, money, or car keys. The front side also sports a see-through white mesh netting that’s great for storing non-essential accessories. The weatherproof pouch is made of sturdy nylon. Like other popular models, the waste bag dispenser is located on the back side of the pouch. You can draw poop bags out through a black silicone insert near the bottom of the pouch. The back also features a metal belt clip. 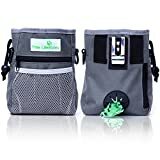 To the sides, the pouch is equipped with a pair of D-rings which can be used to hang a clicker, collapsible water bowl, or other useful accessories. The bag has no side pockets. You can wear this pouch in three different ways – around the waist, over the shoulder, or on a belt. OUR PETS, OUR FAMILY! - Not just our motto but the principle we had in mind when we created your Perrama Treat Bag for Dog Training. With a practical design it securely holds in generous amounts of dog training treats, kibble, accessories and dog toys. Use your waist treat pouch, FREE training clicker and dog bowl for the best training experience of your life! A TREAT POUCH CAN BE A LIFESAVER - Especially if you're training a pup and we, the dog owners, know the importance of having treats on hand. A truly great dog treat training pouch should fit your essentials and keep them organized at all times. With two pockets, one large compartment, and a poop bag dispenser, Perrama Pet Treat Bag keeps everything organized and within easy reach. DOGS LOVE TO HAVE JOBS - Keep your dog active with a great training in the park or just enjoy a fun and peaceful morning walk. Whatever you choose he will be happy and healthy. In any of these occasion Perrama Dog Training Bag offers multi-wear options. Featuring two adjustable straps and one metal belt clip, the training treat bag can be carried on your shoulder, as treat waist pouch or attached to your belt. SECURE SPACE FOR YOUR STUFF - You can safely store your smartphone, money or keys in the zippered pouch or front mesh netting. Plus, since it is small and lightweight, it is not cumbersome to have along with you. You will love this and it will make training and walks so much easier and fun! It even features a reflecting strap that keeps you and your friend safe during night walks. Isn´t this great? YOU ENTER IN OUR LIFE as a customer but you will leave as a friend. For all our friends we guarantee our Dog Treat Pouch with full 100% MONEY BACK if you just simply find out it is not the best suit for you. Mentioning we are also offering a free e-book TRAINING GUIDE you can find no reason why not to CLICK ADD TO CART NOW! A good dog treat pouch should offer some handy extras on top of the basic features. The Perrama is an affordable dog treat pouch with a rather conventional design and construction. What sets it apart is that the package also includes a clicker and a collapsible water bowl. 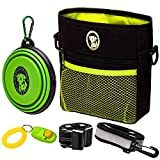 The Perrama Dog Treat Training Pouch is black with neon green accents. It is made of durable nylon fabric and waterproof. The pouch is equipped with a sizeable main treat pouch, two zippered compartments for accessories, dual D-rings, a mesh compartment in front, and a poop bag dispenser in the back. The main compartment is outfitted with a neon green nylon lining and can hold large amounts of your dog’s favorite snacks. To make cleaning easier, the lining can be pulled out. The main compartment can easily be closed with a drawstring. Aside from the main treat compartment, this pouch also has a pair of pockets in which you can store your phone, money, and other essentials. The two are spread out front and back. Additionally, there is mesh netting in the front for additional storage. The poop bag compartment is neatly tucked away in the back. The bags can easily be pulled out through a silicone insert at the bottom of the compartment. Similar to many other treat pouches, you can wear the Perrama in three standard ways; you can strap it around your waist with the detachable waist band, hang it over your shoulder with the shoulder strap, or attach it to your belt via the metal clip located in the back. The included bowl is collapsible and made of BPA-free plastics. It has a 350ml capacity and can easily be attached to the pouch’s side D-rings via its carabiner. Side and Front Pockets: Two small side pockets with a waste-bag dispenser feature (one side only). Small pockets can fit clickers, whistles, poop bags, etc. D-ring attachments on the small side pockets allow you attach gear with carabineers, etc. There is also a roomy front pocket with Velcro closure. The front pocket is large enough to store a small leash or a handful of treats. Zippered Back Compartment for Your Phone! : Roomy enough for cell phones, keys, credit cards and more. Here at Pet Expertise, this is our favorite feature (along with the divider panel)! The Doggone Good Rapid Rewards Deluxe Dog Training Bag offers ample room for treats and accessories. The low-key styling eschews neon meshes and reflective straps. A number of color options are available. This pouch comes with a sizeable treat compartment and several storage pockets. The main compartment can hold approximately three cups of your pet’s favorite treats and is big enough even for the longest training and walk sessions. The compartment sports a grey interior and can easily be closed via the built-in magnet, which is silent enough to evade your dog’s detection. Along with the treat compartment, the inside of the pouch also features one of several pockets. You can easily pack your car keys or a smaller phone in the pockets. If you have a bigger phone, you can store it in the front pocket which is also secured with Velcro. The pouch has a pair of small side pockets, as well. These can hold a clicker and other small extras. Both pockets are equipped with D-rings. In the back, there is a pocket intended for storing poop bags. Unlike most models out there, you’ll have to open the zipper to get a bag out. Similar to the majority of reward bags, you can wear this Doggone Good model in any one of three ways: around your waist, over the shoulder, or on your belt. The best dog training treat pouch should ideally be big enough to carry enough treats for long sessions, in addition to the basic requirements of sturdiness and durability. If you’re looking to add a training pouch to your dog training arsenal, then the simple and versatile Dog Training Pouch by Paw Lifestyle might interest you. The pouch offers a big main compartment, waterproof construction, and a handy waste bag dispenser. If you want a pouch with accessories, you might want to check out the Perrama Dog Treat Training Pouch. This model comes with a sizeable treat compartment and features a clicker and a collapsible bowl. 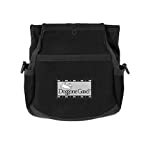 Finally, if you need a lot of room and want a discreet pouch, the Doggone Good Rapid Rewards Deluxe Dog Training Bag might be your best bet. This pouch offers a ton of space and the main compartment opens and closes silently.